Make your fortune on the high seas! 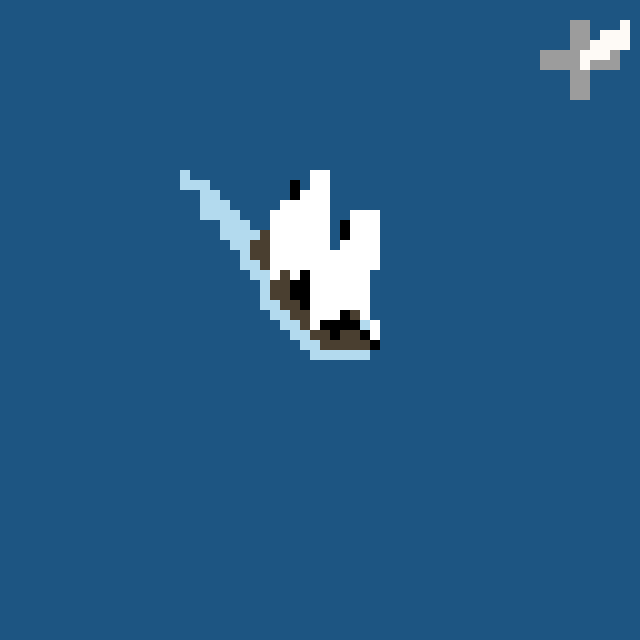 An entry for LOWREZJAM 2017. The aim of the game is to earn your fortune (100 gold) in as few days as possible by buying and selling goods at ports. Use the wind direction indicator in the top right to move efficiently between ports, take note of fluctuating prices and make sure you avoid the pirates! At the start of the game your ship's anchor is lowered and the sails are raised. With both anchor and sails raised your ship will not be affected by the wind but will still move very slowly and can be turned. This is ideal for tight manoeuvring. Lower your sails to use the power of the wind. Your heading relative to the wind direction affects your maximum speed. 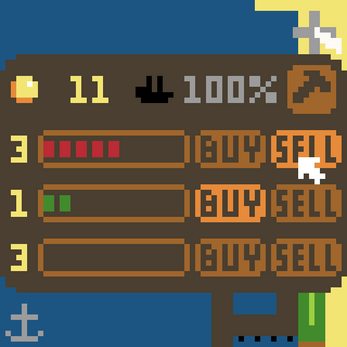 Your ship will need to be near a port with your anchor lowered to buy and sell goods from/to it. While telescope mode allows you to see further, it does not show you the entire map. Follow other merchant vessels to find new ports to trade with. Colliding with land or ports at significant speed will cause damage to your ship which can be repaired at ports. Being hit with pirate cannon fire also damages your ship and you may lose an item of cargo. Damage will affect your ship's maximum speed and if you suffer too much your ship will sink. If you collide with a pirate ship or they collide with you, you'll be boarded and lose the game. Unfortunately I ran out of time so this game completely lacks audio. It's also missing some niceties, like a menu screen, and a fair few features I originally planned for... Apologies.